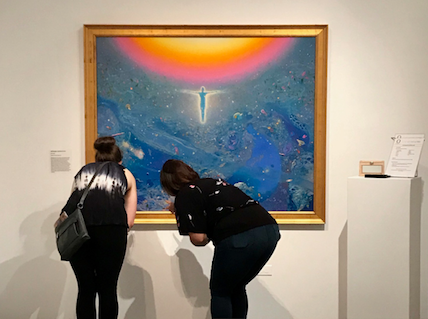 The Oceanside Museum of Art in California reports that they had a “wonderful” multi-sensory Slow Art Day 2019. The museum developed three self-guided stations aimed at slowly engaging multiple senses – designing multi-sensory experiences is a growing trend in the slow art movement (see the webinar we hosted in January 2019). Pairing music with paintings in their surrealism exhibition (photo to the left). They ran Slow Art Day through the weekend and had many more people participate as a result. In fact, Slow Art Day and the self-guided stations were so successful – led to so much visitor participation – that the curatorial staff has asked that stations remain up longer. The variety of activities – and the multi-sensory element – really allowed visitors to participate in ways that worked for them and that also added a sense of fun. P.S. I’m particularly pleased with this report given that my mother lived in Oceanside for years and ran a clandestine Slow Art Day at this museum with a few friends when we launched a decade ago. 175 Slow Art Day venues around the world (and counting) - Saturday, April 6, 2019. Here are some basic options for how Slow Art Day works around the globe. Click on the list of 2019 venues, find one near you and register online (it's free). Show up on Saturday, April 6, 2019 at your venue, pay the admission fee (if there is one) and then look slowly - 5-10 minutes - at each piece of pre-assigned art. Some museums pick 5 pieces of art, others may concentrate on 1 or 2 - while yet others will give more options. In some cases, you can meet up with your host and the other participants at a pre-assigned lunch spot. In other cases, museums will facilitate discussions in front of each piece of art. Whatever the design is - what all the events share is the focus on slow looking and its transformative power.